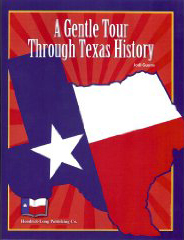 A guide for teaching Texas History through existing books from the library, many of which are also available from Hendrick-Long. Reminiscent of teaching history through literature but with added websites and tours. Ages 10 and above, 44pages, 8-1/2 x 11"